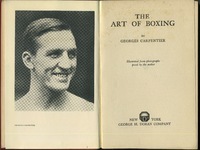 Published by George H. Doran Company (New York), the year of Carpentier’s retirement from the ring (although Carpentier’s “full record,” as provided in the back of the volume, ends with the Tunney fight of 1924). There is no indication that this is a translation from the French. Although this is an instruction manual, the text is not the same as that of My Methods or Boxing as a Fine Art (1913). It includes photographs, which appear to have taken specifically for the volume, of Carpentier demonstrating various stances and punches, in a field behind a barn. Of note is Chapter XIV: “Is There a French Style?” (149-156).